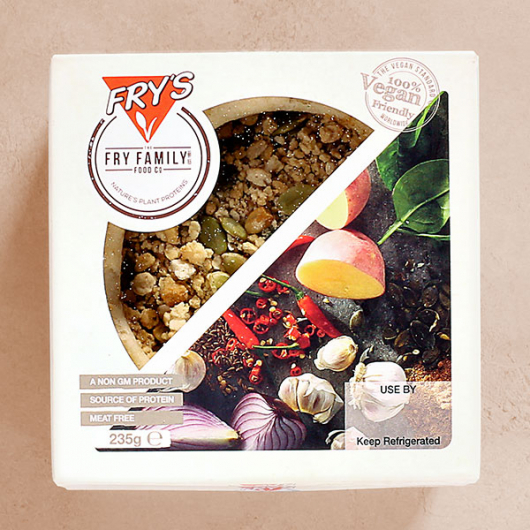 Packed with nutrients and vegan goodness, this Fully Loaded Chicken Style Country Pie from Fry's is the ultimate comfort food! The open top country pie is flavoured with cumin, parsley, chilli and garlic - all encased in a golden, crispy, vegan pastry. 100% vegan friendly, it contains no animal products and is completely GMO free. Eat on its own or serve with potatoes and veg for a real feast. Delicious and really filling. The topping comes loose in the box but I just piled it on the top. Sweetened Soya Extract [Water, Hulled Soya Beans, Sugar, Acidity Regulators: (Monopotassium Phosphate, Dipotassium Phosphate) Calcium Carbonate, Flavouring, Salt, Stabiliser: Gellan Gum, Vitamins (B2, B12, D2)], Wheat Flour (Wheat Flour, Calcium Carbonate, Iron, Niacin, Thiamin), Vegan Chicken Strips (13%) [Vegetable Protein (Wheat, Soya), Sunflower Oil, Flavouring, Potato Starch, Wheat Flour, Maize Starch, Thickener: Methyl Cellulose, Salt, Garlic], Sweet Potato (6%), Vegan Béchamel Sauce [Cornflour, Dairy-Free Creamer (Sunflower Oil, Glucose Syrup, Modified Starch), Yeast Extract, Sugar, Salt, Onion Powder, Black Pepper], Margarine (Vegetable Oils (Palm, Rapeseed), Salt, Emulsifier: Mono Diglycerides Of Fatty Acids, Colours: Annatto, Curcumin), Crumb Topper [Rusk (Wheat Flour (Wheat Flour, Calcium Carbonate, Iron, Niacin, Thiamin), Sunflower Oil, Parsley], Spinach (2.5%), Pumpkin Seeds, Vegetable Oils (Palm, Rapeseed), Garlic Puree, Olive Oil, Fried Onions (2.5%) (Onion, Rapeseed Oil), Salt, Dextrose, Ground Cumin, Ground Nutmeg, Whole Cumin Seeds. 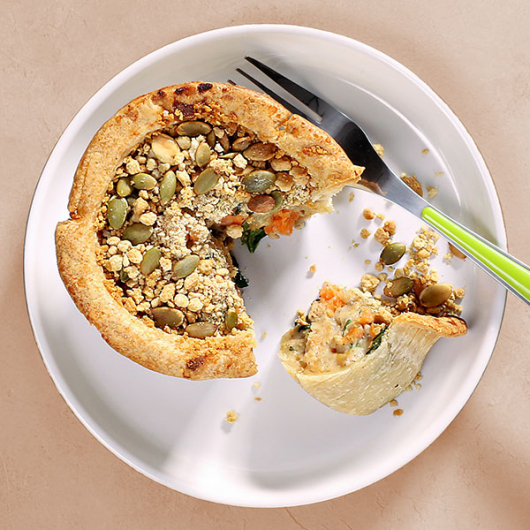 Remove from the carton & place on a baking tray on the middle shelf of a pre-heated oven at 180°c/350°c/gas mark 6 for 22 - 25 minutes.